There’s more travel preparation to do once you have your itinerary planned. There are still things to do. Your itinerary is set, now be sure you have some travel essentials taken care of. Put aside those glossy brochures and stay away from all the colorful websites about your destination. Now it's time for the rest of the travel preparations. Experienced travelers will have their passports... but even some who have traveled in the past fail to make sure their passports are valid for the length of their trip and beyond. If you don't have a passport, get one as soon as you start thinking that you want to travel. U.S. Passports are good for 10 years, and once you have your passport, maybe you'll be more apt to actually make those plans. Apply early, during peak travel preparation seasons, passport can take longer to get. If you have your passport... Make sure that it is still valid... and that it will be valid for 3-6 months after your return. More and more countires are requiring this. 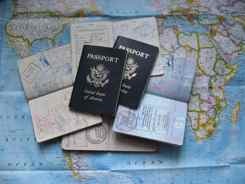 U.S. citizens should remember that rules have changed even for travel to Canada, Mexico and the Caribbean... passports are necessary more than ever... they're an essential part of travel preparation. Put this at the top of your custom tour planning list. You can download a passport application from the US State Department. Citizens of other countries should contact their government passport agency. A visa is permission from the county you will be visiting to allow you to enter. All counties have a visa process, but it varies from country to country. ...and some countries don't require a visa for short visits. Find out if you will need to get a visit before you leave on your trip and add this to your travel planning list once you've decided on your itinerary. 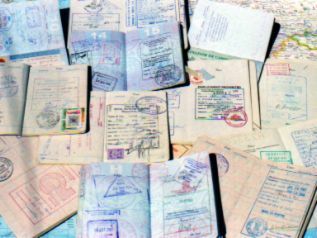 We have a whole section on information about when you need them and how to apply for passports and visas. So let me repeat... allow enough time! Our page on vaccinations might be a good addition to your custom tour planning list. Your health is important. There are other health tips in that section too, so look around. We're glad to help. Remember to check which card will give you the best rate if you're paying in foreign currency... the wrong card can add 3% to your trip cost! And in some countries, your hotel or agency may add the fee they are charged by the credit card company to your cost. We shouldn't have to say that you want to make sure you are using a secure site if you send credit card information. Don't ever send it in an email. One of our readers sent in a great tip on Ways to lower international transaction fees. You’re more apt to find you’ll have to use this option if you deal with a local agency in a developing country. We’ve had some travel agencies abroad ask for bank transfers or wire transfers. We’ve saved money making tour arrangements this way, but your bank will charge you a fee to wire that money. On one occasion our foreign even charged us a fee to receive the transfer! Even with that, dealing with local agencies can save you enough money that this all becomes worth it. Once you've talked to your bank this generally happens overnight.... but you want to be sure you get confirmation and take that with you. Some small US agencies may actually want you to pay with a personal check or money order. We've done this many times, and it has always worked out fine. Sometimes we've done it to save credit card fees. We shouldn't even have to tell you to take this, but we will. It is amazing how many people told Mark at the airport that they left their passport home! Don't leave anything at home. That way you will leave the minimum to chance..... and chance always comes into play! We have a travel document checklist to help you too. Our list of checklists is on the bottom of the column at right. A list of lists? Yep. If you go through all the steps preparing for your trip, you trip will go more smoothly. Travel preparation... It's not always the fun part, but those lists will get you through it. You don't want to forget anything. Get to packing, and get going!!! !